If your cat has a blocked tear duct, you may notice rust-colored stains beneath her eyes. This common problem is not painful but can look unsightly. As an owner, it's important to understand the cause of your cat's tear duct problem to unlock the best way to deal with it. Be it a cat, dog, or human the anatomy of tear ducts is similar. As the Animal Eye Care Center explains the inner corner of the upper and lower eyelids are two small ducts or tubes. These two small tubes connect together into one larger bore tube (think of a Y-shape) that drains into the mouth. The job of the duct is to drain away excessive amounts of tear fluid. This is a nice anatomical detail Mother Nature added to eyes, to avoid a permanently wet face. However, if the tear ducts block, then tears have no option but to spill over the face. According to MSD Vet the symptoms of a blocked tear duct are mainly wet fur beneath the eye. With time, the fur will stain brown or rust-colored. This is due to oxidation of chemicals in the tear fluid, (it is the same process that causes the cut surface of an apple to turn brown.) However, a vet check is still important because tear staining can also be the result of eye infections, corneal ulcers, or allergies, all of which will need specific treatment. Your vet will check the cat's general health for signs of a cold, flu, allergies, or respiratory illness that could cause an eye discharge. Even a healthy tear duct can't drain away all the fluid from an eye that's watering heavily. Think of this as a fully open faucet running into a sink with a narrow drain hole; inevitably water overflows. Then the vet examines the eye itself, alert for signs of infection, ulceration, inflammation or allergy. 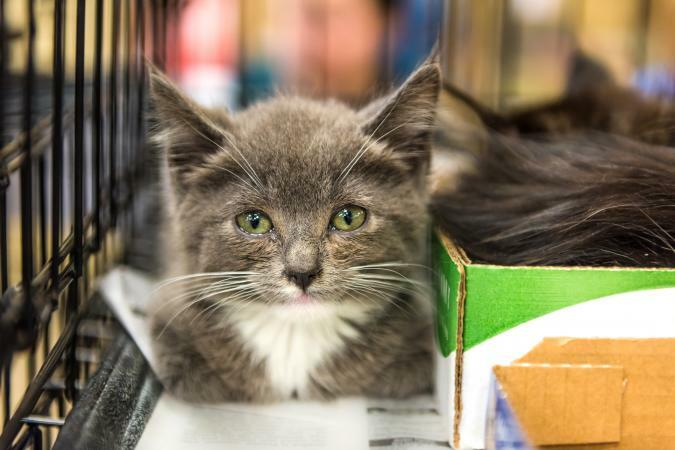 In addition, he will examine the facial anatomy of the cat, because flat-faced breeds such as the Persian, have tear ducts that are situated in such a way that they gather tear fluid which leads to overspill. Finally, as VCA Hospitals outlines, the vet places a few drops of an ophthalmological dye, called fluorescein, into the eye. This should drain away via the tear ducts to produce a green stain inside the cat's mouth. When the tear ducts are blocked, the fluorescein takes the path of least resistance which is to spill down the cheek. An obvious orange stain on the fur beneath the eye clearly shows tear duct drainage is a problem. Vetary notes there are several reasons why a cat's tear ducts block. Dust or grit washed from the surface of the eye accumulates in the narrow tear duct and causes a physical blockage, in the same way grease may clog a sink outflow. When the eyelid or skin becomes inflamed, it swells. This swelling then compresses the narrow tear duct and impedes good drainage. The entrance to the tear duct needs to be presented to the eye at a certain angle in order to collect tear fluid. International Cat Care notes flat-faced cat breeds or cats with in-turned eyelids, in particular, often have poor angulation which means that tears either roll over onto the face without entering the tear duct or can't physically get into the duct. Occasionally a kitten is born with the entrance to the tear duct sealed with a fine membrane. Another common cause of blocked tear ducts is when a watery eye produces fluid faster than the duct drains it away. This is not a true blockage because the duct still works, but can't cope with the volume of fluid produced. Identifying the cause of the drainage problem may provide a way to treat it. However, in some cases there is no answer, in which case managing the tear overflow and keeping the face clean is the best solution. The Vet Times suggests that owners have several options. A blockage may clear when the duct is flushed with saline. This procedure requires the cat to be anesthetized. A special cannula is passed part way into the duct and attached to a syringe containing sterile saline. Gentle pressure is applied to the syringe plunger to force saline into the duct and dilate it. When successful, this pushes the blockage into the wider part of the canal and out into the mouth. However, success is variable as blockages can be too well established to shift. Kittens born without a patent (open) tear duct can benefit from having the duct pierced when under anesthesia to be desexed. Sadly, this condition is often associated with unusually narrow tear ducts so the results can be disappointing. 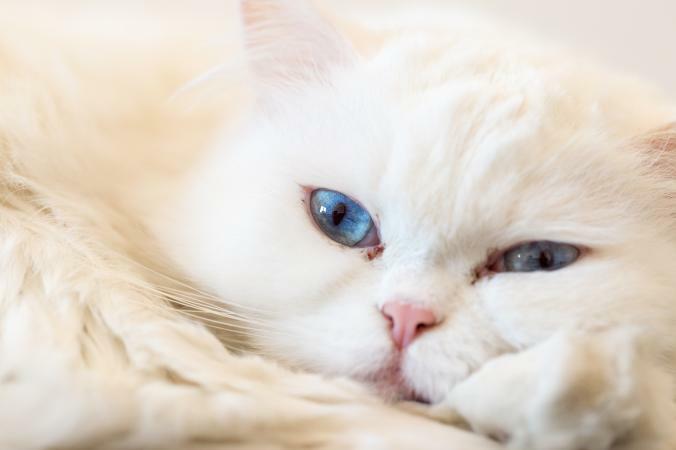 Cats with extreme in turning or 'entropion' of the eyelid, which presses the tear duct against the eyeball can benefit from corrective surgery. This involves removing a small segment of skin from below the eyelid in order to turn the lid outward and into its correct position. This can be highly successful provided the tear duct is otherwise healthy. Viral infections or allergies that cause weepy eyes are primary causes of tear overflow. Treating the main condition and returning tear production to normal, allows the tear duct to cope and adequately drain the fluid away. Anecdotally some cat owners find that placing a warm poultice immediately beneath the lower eyelid can help relieve a blockage. To do this soak a piece of cotton wool in warm (not hot) water and squeeze it dry. Then place the warm cotton wool against the skin for five minutes. This helps dilate the tear duct and may be sufficient to allow an obstruction to pass. Pet Education explain it's not always possible to reinstate normal tear drainage, in which case managing the tear overflow is the best option. When eyes are wiped and dried regularly before oxidation happens, this reduces the brown staining. To do this use a damp cotton wool ball squeezed dry, and wipe the discharge away. Use a separate ball for each eye. How often you do this depends on how watery the eye is. If the cat has constantly runny eyes, then continually wiping is not practical. Sadly, there are no products proven to remove tear staining, despite claims made to that effect. Be cautious when selecting a product and avoid those that contain bleaching agents such as hydrogen peroxide as its use is not recommended near the eye. Anecdotally, some owners believe the mineral content of water contributes to tear staining, so experiment with bottled or mineral water to see if this reduces the staining. Other anecdotal remedies some people find helpful include adding a teaspoon of parsley or a teaspoon of apple cider vinegar to food. However, apple cider vinegar is an acid and may change the pH of your cat's urine. This is significant because acid urine is linked to the production of oxalate bladder stones. Thus you must weigh a cosmetic problem (brown staining) against a life-threatening surgical condition (bladder stones). In freezing weather, a wet face can cause skin infections. For outdoor cats, apply a thin layer of Vaseline onto the skin, three times a day. This provides the skin a degree of protection against chapping. Brown tear staining can result from several problems, of which a blocked tear duct is one explanation. A vet check is advisable, especially if the cat squints, the eye is swollen and red, or the discharge is a yellow-green color. Treatment for the underlying problem is often effective, but when therapy doesn't work, keeping the eye clean prevents that telltale staining.